This entry represents something that I REALLY need to do more of...simply going out and sketching people, things, whatever!! When Chris had her store, I used to be able to go with her to different markets, and while she was busy in the various convention centers buying children's clothing, I would be wandering about aimlessly with my sketchbook. It can be a bit frustrating, but sometimes very rewarding. The frustration comes when either what you draw doesn't look anything like what you are observing, or you create a wonderful sketch, and your subject leaves just before you finish it. To eliminate this second form of frustration, I got pretty good at "fast sketching", a process of getting the gist of the subject on paper as fast as possible, then filling in the details at my leisure. 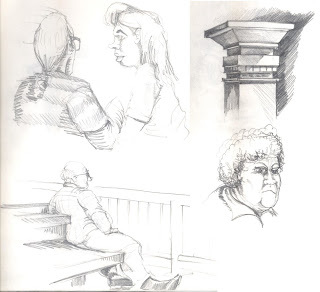 You can see from these sketches that the subject that is the most developed is the architectural post. You might think that is because I have a background in architectural forms and features. You would be wrong! That capital is well-developed because it couldn't leave before I was done sketching it!! Yep...inanimate objects can be very rewarding as well! It is also really embarrassing to ask them to hold still, damit...I am drawing them!! eToro is the #1 forex broker for newbie and advanced traders.